Showing 19 articles from April 3, 2013. The Evaline School District has come forward to oppose letter grades recently assigned by the Washington Policy Center (WPC) to schools in the state. Toledo High School Interim Principal Martin Huffman has been hired on a permanent basis after a job offer was extended by the District Board Thursday night. Huffman was hired last summer in the wake of administrative shakeups due to the resignation of former Elementary School Principal Ron Reynolds. Then-High School Principal Lisa Hull took over Reynolds’ position at the elementary school while Huffman, former Superintendent of the Lyle School District, was brought in to lead the high school on a one-year contract. Toledo High School will be hosting the second in a series of Coffee House programs April 11, featuring the talents of students and community members alike. Starting at 7 p.m. in the High School Commons, the event is free to the public and intended to give students a venue to perform and practice what they have been learning. To honor the recent achievements of Toledo High School’s boys basketball team, residents Keith and Judy Kammerzell have donated a Fredrick Remington sculpture to the school, for which they were thanked during the Toledo School Board meeting Thursday night. 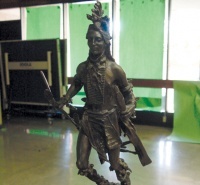 Titled "The Warrior," the sculpture is of an Indian tribesman in full headdress "ready for war," stated Keith Kammerzell, who said the donation was made in response to the team’s WIAA 1A state championship victory in Yakima last month. The weather for Easter weekend was glorious. Not a cloud in the sky, flowers blooming everywhere, the greenest of green fresh-mown grass. Spending more time outdoors, I’ve seen the arrival of some of our favorite nesting birds. Walk around wearing red, and you’ll get buzzed and beeped by the hummers. Meanwhile, the violet-green swallows are actively house-hunting. A "local" says that the official sign of spring is when the juncos leave – for the record, I saw one on Saturday. Jedediah Morse was in the area in 1820, as he reported on seeing three of the Cowlitz villages on the Lower Cowlitz River 62 miles from the Columbia. It is of interest to note that he had to have passed numerous other Lower Cowlitz villages before he got that far up the river. Valley View Health Center hosts South County Senior Health Fair at Toledo Elementary School 8:30 a.m. - noon Tuesday. Visit www.vvhc.org/Events.html or call (360)330-9595. Toledo Garden Club meets the first Thursday of each month at the Presbyterian Church. You are invited 1:00 p.m Thursday to the Fireside Room for light refreshments. 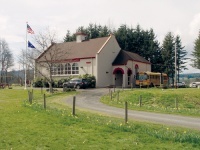 May 2 meet at the church 11:00 a.m., carpool to lunch then continue on to the Dirty Thumb or Adna Floral Nursery. Visitors welcome. Thanks to the members of the Lions Club for making Saturday’s Easter Egg Hunt possible. We know we printed otherwise in the last column, but the volunteers at the club make the egg hunt possible every year, not City Hall (our bad). Organizers said the event was a success, and the bright sunshine that day sure didn’t hurt. First of all, I’d like to announce that Jesse "Clark" McAbee, the Director of the Skagit County Museum, will be a guest speaker at the Olequa Senior Center on Sunday, April 7th, at 2 p.m. A well-renowned historian, McAbee will be discussing the Japanese immigrants working in mills and the logging industry in the Northwest during the decades preceding World War II. This free event is open to the public and is brought to you by the Winlock Historical Museum, which is open every Wednesday from noon to 4:30 p.m. For more information, please contact Ken Vogel at 785-0567. Ah, isn't it wonderful that Raymond will move into the local and possibly the state history books as having the first marijuana (cannabis) processing facility and distributorship in our state. A positive thought for a passed democratic leader John F Kennedy. I would like to honor him posthumously for a few things he did. The Winlock Easter Egg Hunt, which has been going on for 49 years, was once again a success. The Winlock Community Club, who sponsors this event, would like to thank all donors that supported the egg hunt. These donations allow the Easter egg hunt to continue. 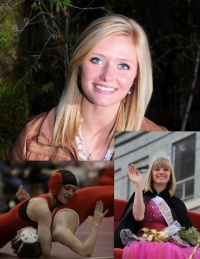 One of the most celebrated student/athletes to graduate from Winlock High School is on her way to Oklahoma City University to compete as a wrestler and enroll in the institution's nursing program. 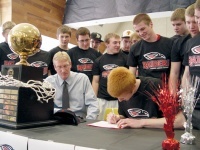 Surrounded by teammates in the Toledo High School Commons, senior Brennan Rakoz (foreground right) signs a letter of intent Thursday to attend Southern Oregon University where he plans to play basketball under the leadership of Head Coach Brian McDermott (foreground left). 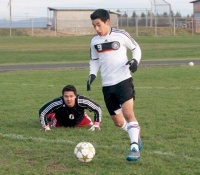 After dropping their first four games, Toledo/Winlock United has come on strong with three consecutive victories. On Tuesday, United defeated La Center for the first time in five years with a 2-0 shut-out, and then Thursday United thumped Castle Rock 8-2. 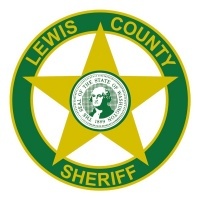 A muddy boot print was all that was left during an attempted break-in at the Vader’s historic jailhouse March 25, according to the Lewis County Sheriff’s Office. An officer-involved shooting almost occurred near Toledo March 14. Deputies responding to the 100 block of Smokey Valley Rd., south of town, were told that resident Matthew Pettit was acting erratically, had made threats against the lives of his family, and was possibly armed due to the absence of a .22 caliber pistol from the collection of firearms at the residence. One sentence and one arrest were issued by Judge Steven Buzzard during Winlock Municipal Court Today. Kyle E. Rogers, 31, of Winlock, is wanted on a no-bail, nationally-extraditable warrant for escaping community custody.